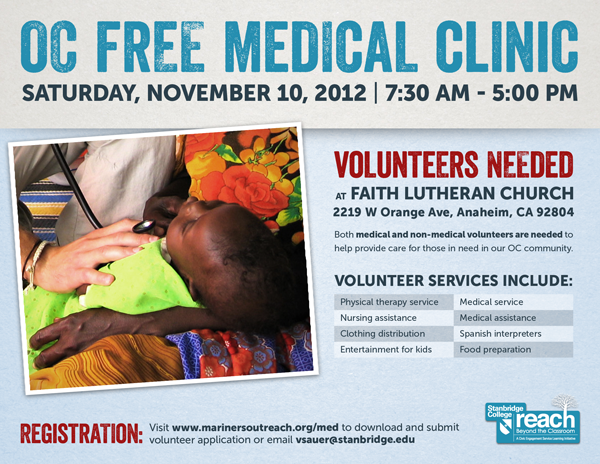 Stanbridge College REACH Beyond the Classroom™ encourages you to volunteer for the Orange County Free Medical and Dental Clinic & Festival on Saturday, November 11, 2012. Sign up to help those without access to basic healthcare services. The Orange County Free Medical and Dental Clinic & Festival is hosted by Mariners Outreach. They are looking for both medical and non-medical volunteers to help provide care for those in need in our OC community. A typical clinic will see about 200-300 patients who cannot access medical and dental services on a regular basis. The medical care is basic primary care and typically there are approximately three children for each parent in these clinics. Let’s work together to ensure our Orange County community is healthy, happy and warm all year round. Stanbridge Gets Spooky! Halloween Photo BoOoth and Costume Contest!